Walking to school is an ideal way for children to learn more about their local area, to raise their fitness levels, to save money and to look after the environment. Regular walking can help to reduce stress, control weight and bring energy and confidence. Walking to school can also help kids to become more independent. Your child’s personal safety should be top of the agenda, however, if they are travelling to school without adult supervision. How can you help your child to keep safe on the way to class? Ensure that your child understands the importance of walking directly to school, without stops or diversions. Explain the principles of ‘stranger danger’ to your child. Make sure they know not to stop to talk to anyone on the way to school and to ignore any drivers who might slow down to speak to them. Tell them never to accept a ride from anyone unexpected. Take care to tell your child to walk on the pavement, wherever possible. You might like to walk with them the first few times and to work out the safest together. Make sure your child knows to stop at red lights and to always look both ways before crossing the road. Remind them to stop, look and listen. 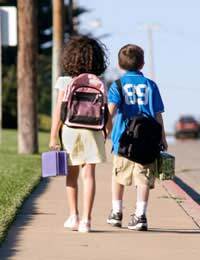 If possible, encourage your child to walk to school with a friend who lives nearby. If you are worried about the prospect of your child walking to school alone, find out whether a walking school bus operates in your area. If one does not already exist, consider setting one up. Even a very informal arrangement whereby local parents take it in turns to walk a group of children to school will do. Buy reflective yellow clothing or accessories for your child to ensure that they are visible to vehicles. This is particularly important if your child is likely to be walking very early in the morning or in the afternoon in winter months, when light levels are lower. These clothes and accessories are usually lightweight, meaning that they won’t take up much room in your child’s school bag once they arrive at school. Teach your child to assert their place on the pavement. Explain to them that they should keep away from the kerb and that on no account should they allow other pedestrians to force them into the road. Explain to your child the importance of having your wits about you whilst walking. Advise your child not to talk on a mobile phone as they walk and to avoid listening to music too. As well as keeping your child healthy and minimising their carbon footprint, walking to school is sure to heighten your child’s awareness of the world around them, encouraging them to take some responsibility for their own personal safety. Waving your child off on their walk to school can be a daunting moment but it is also a key step in their development. Importantly, worried parents should remember that they are role models for their children. Be sure to set a good example for your child, stopping at red lights, looking both ways and keeping alert whilst walking.